Career success depends on growing past the awkwardness into the mature poise that others can rely on. Using the strategies found in 14 Tips on Business Etiquette: Setting a professional tone with co-workers, clients and customers, you’ll look forward to professional interactions as opportunities to shine while advancing the organizational agenda – and your own career. Claim your FREE copy now! Business Management Daily, publisher of Mastering Business Etiquette & Protocol, has compiled this report to help you discover best practices on making proper introductions, cubicle etiquette, “casual dress” rules, handshake protocol, guest etiquette, workplace behavior faux pas, business dining etiquette, office wedding invites and other co-worker special occasions, business letter and email protocol—and even how your office decorations may affect your professional image. 1. Don’t “prairie dog.” Walk around the partition to see a neighbor, instead of popping your head over the top. And as you walk down the passageways, don’t peek into each workstation. 2. Grant your neighbors private time. Stagger lunch breaks to provide everyone a few minutes alone at their desks. 3. Don’t chime in to conversations you hear over the wall. Whether it’s a work question you can answer or a private conversation you’d rather not hear, ignore comments that aren’t directed at you. 4. Keep lunch in the kitchen. Or, when you absolutely can’t leave your desk for a meal, choose foods without strong odors, and dispose of your trash in the kitchen, not in your own wastebasket. Casual. Corporate casual. Business casual. Smart casual. Resort casual. Don’t leave meeting attendees baffled about your event’s dress code. Explain what you mean by “business casual” or “corporate casual,” etc. with examples of appropriate attire for men and women. One event’s “resort casual” encouraged wearing jeans, while another explained that shorts were acceptable, but not denim or cutoffs. Tip: Map your course of action when attending a meeting where the dress code is unclear. Find out how in 14 Tips on Business Etiquette. The situation: You find a personal—and potentially embarrassing—document left behind on the photocopier. Solution: Normally, you’d put forgotten pages in a tray beside the copier, for people to claim later. In this case, though, deliver the document in person, advises Peter Post, author of The Etiquette Advantage in Business. A good, well-timed handshake to pair with your smile is a sure way to stand out, whether you’re at the company picnic or an industry conference. Here’s how important it is: A prospective employee with the best handshake is more likely to get the job, research shows. Even if you’re not a job-seeker, a good handshake will grant you instant rapport when meeting someone new. Find a refresher course on the business protocol of the perfect handshake in 14 Tips on Business Etiquette. Your friend at work gets handed a pink slip, and now you feel awkward. So awkward, in fact, that you’re tempted to do nothing. But that’s the last thing you should do. Set up a gathering, once the initial shock has faded. Make it just the two of you or invite others, so you have time to say goodbye outside the office. Keep it focused on the person, and “understand that some things are out of our control,” advises psychologist Kenneth E. Reinhard. 14 Tips on Business Etiquette: Setting a professional tone with co-workers, clients and customers also presents real-life etiquette questions answered by “America’s foremost authority on manners,” Letitia Baldrige. And you’ll learn tips on how to finesse awkward, embarrassing situations at work, courtesy of the great-grandson of Emily Post, etiquette expert Peter Post. When a VIP comes to your office, how do you dole out extra-special treatment? Being friendly and responsive is the key to treating VIPs well, says Peter Post. Find out how to implement Post's advice and more in 14 Tips on Business Etiquette. Bite your tongue. When someone screams on the phone, your first thought may be, “What a jerk!” But that attitude will only poison an already-tenuous relationship with the caller. Instead, stay calm and listen. Let ’em vent. Like a whistling kettle, angry callers need to vent some steam. Don’t interrupt—even with a solution—before they tell their story. Take it down a notch. Instead of raising your voice to match the caller’s volume, speak softly. That will soothe the speaker and show him or her that you’re interested in handling the complaint in a calm, rational way. Kitchen faux pas: Who ate my yogurt? Some employees can tolerate co-workers’ swearing and rude behavior, but don’t even dream of touching their yogurt or ham sandwiches. The most offensive thing an office worker can do is steal colleagues’ food from the office fridge, says a TheLadders.com survey of 2,500 U.S. employees. A full 98% agreed that fridge raiding was unacceptable workplace etiquette. Respondents also cited, in order: bad hygiene, bad habits, drinking on the job, swearing, wasting paper, cooking smelly food in the microwave and using a BlackBerry in meetings. 1. Post a copy of the clean-fridge policy on the refrigerator door, so no one will have any excuses. 2. Make it easy for people to label containers with their names and expiration dates by keeping a marking pen and tape in the kitchen. 3. Promote safe food storage by posting the USDA’s cold storage chart. Not only is there no such thing as a free lunch, but those birthday cakes for co-workers can cost you, too. It’s not unusual to be asked to help pay for celebrations at the office, such as birthdays and baby showers. In a survey by OfficeTeam, more than 75% of respondents said employees chip in at least once a year; 15% said employees receive donation requests monthly. Access more of Ensminger's business letter etiquette guidelines in 14 Tips on Business Etiquette. Whether you’re lunching with peers at a convention or meeting with a vendor, business dining etiquette can keep you from marring your image with a faux pas. Here are five etiquette rules for business meals, according to Robin Jay, author of The Art of the Business Lunch: Building Relationships Between 12 and 2. Never, ever talk with your mouth full. Instead, take small bites so you can quickly swallow if somebody asks you a question, Jay says. Come prepared with a few casual, non-business topics in mind. It helps you avoid awkward silences. People enjoy giving their thoughts on subjects like travel, sports and movies. Know your lunch partner’s business. It’s especially key when your tablemate is someone you’d like to impress, but the rule holds true regardless. The fewer times you have to say (or think), “I didn’t know that!” the more impressed the other party will be. How to steal this idea: Take a few minutes to do a Google search before you leave for lunch. Office party etiquette is simple: Don’t do anything that you don’t want the entire company to be talking about for several years to come. Contrary to popular myth, an office party is not the place to wear a lampshade on your head. Keep your dignity, and respect the dignity of others. For co-worker special occasions, follow these gift-giving tips in 14 Tips on Business Etiquette. 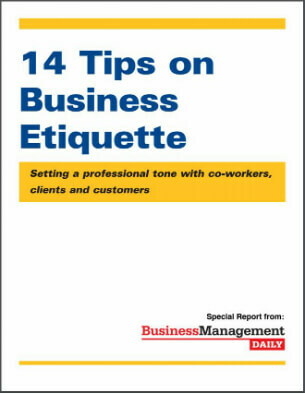 In 14 Tips on Business Etiquette, "America's foremost authority on manners," Letitia Baldrige, answers this sampling of reader questions on business etiquette and protocol. What’s the proper way to introduce business associates? Business dining etiquette: Who pays for lunch? Does it matter who opens a door nowadays? What’s the protocol on presenting my business card?